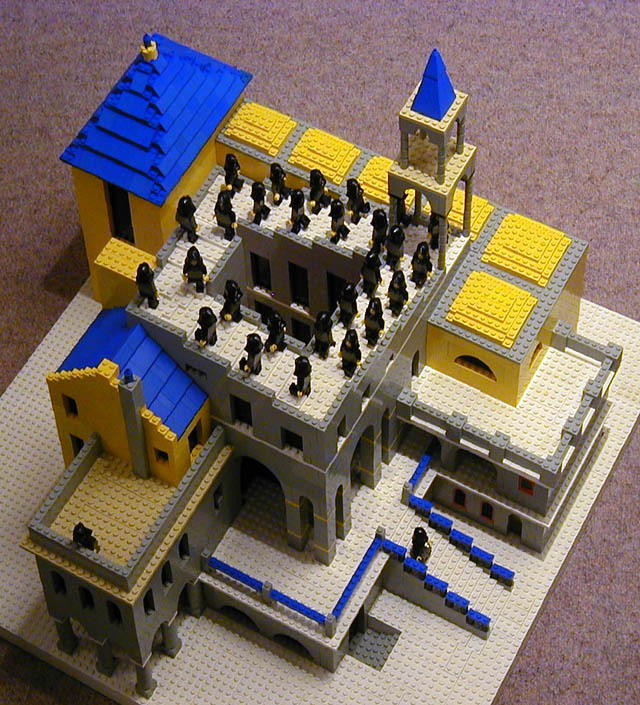 Daniel Shiu and I worked on this as a joint project after we finished our rendition of Escher's "Belvedere", making it our third Escher picture rendered in LEGO (the first one was "Balcony"). No camera tricks, but the picture has to be taken from exactly the right place, and the final photograph was slightly distorted to emphasise the perspective effect. The original Escher picture is shown on the right for comparison. I'm especially pleased with the way the roof in the top left of the picture came out. 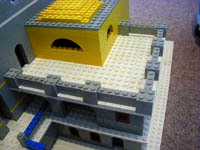 Although I was able to use 45 degree roof bricks for the slopes on the long sides of the rectangle, the slope didn't match either these or the shallower roof bricks produced by LEGO. 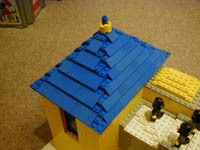 In the end I constructed the slopes on the short sides by putting a layer of plates in between each layer of shallow-sloped roof bricks. All very well, but almost anything you try along the lines where adjacent sides of the roof meet looks awful. I think it's come off quite well, all things considered. 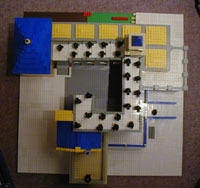 The project spent a few days in limbo while we waited for a couple of Bricklink orders (most of the black cowls came in one of these, and the steep blue corner slope pieces used ontop of the turret thing on the corner of the stairs came in the other). We spent quite some time before we started staring at the picture and trying to decide how to go about it. The secret is that the staircase spirals up and in: if you look at it from exactly the right position, the edge of the top step looks as though it's just lined up with the edge of the bottom step. The picture shows what's going on - I took it from a slightly different position and the edges no longer meet. Actually, because the lower edge is further from the camera than the top one, it looks smaller; we had to build it one stud wider to compensate. After deciding on a general plan of action, I sketched out a plan view on paper. 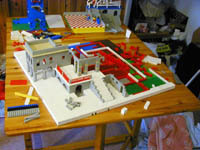 Here's a view of the finished model from above. After sketching a plan view, I built a mock-up of just the top of the stairs in red bricks, and took some photos to make sure it would work. Once satisfied with that, building could start in earnest. 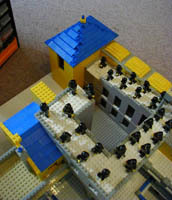 The general plan for where all the walls would go was laid out on a set of baseplates around the mock up, and the walls started going up. 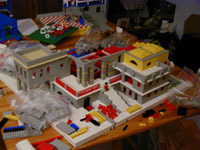 Here you can see the early stages of construction (in fact the original mock-up is still visible in the middle; it hadn't been removed yet). There are a couple of details that I think are worth noting. The blue roof in the next picture was a bit challenging: While standard 45 degree slopes worked nicely on the long sides of the rectangle, the shallower slopes were just a bit too shallow for the short sides. The solution was to put a layer of plates in between each layer of shallow slopes. Of course this made matching up the sloping planes along the diagonal edges a bit of a nightmare, but I'm quite pleased with the result. 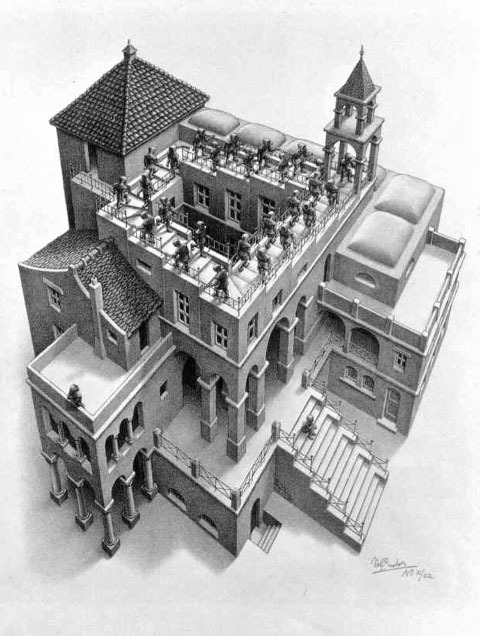 Finally, after taking the photograph, we distorted it slightly (stretched vertically and compressed the bottom very slightly) to emphasize Escher's slightly unreal perspective. While this wasn't from the constructional point of view our most ambitious project (that honour goes to "Balcony" which took several months to complete) it is probably the most visually effective so far.